Greetings, guys and Star Wars fans everywhere! 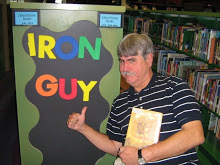 It seems that the Iron Guy has devoted the month of May to the saga of the galaxy far, far away. And why not? The movies are full of what guys love--Adventure! Blasters! Good Guys chased by Bad Guys! Space Battles! Not to mention strange-looking aliens, light sabers and lots of things that blow up. Well, there are lots of Star Wars books that have all this as well. Here are a couple that I've read lately and liked a lot. 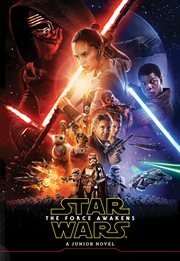 Star Wars: The Force Awakens by Michael Kogge; based on the screenplay by Lawrence Kasdan, J.J. Didn't you just LOVE this movie?? Yes, yes, yes!! It had everything we enjoyed about the original Star Wars trilogy while breaking new ground. This book is a faithful retelling of the movie and, even if you know the story backwards and frontwards, it doesn't get boring. It's like hearing a favorite song all over again. I enjoyed reliving Finn and Po's crash landing, Rey and Han Solo escaping Jakku in the Millennium Falcon and and Hux and Kylo Ren meeting the Supreme Leader. (which leaves me with the question I had from the movie--is Kylo Ren really a villain or just a big whiny kid with a light saber and no impulse control?) Anyway, read this and have a good time! And one more bit of fun--both books have a tie-in with each other. What is it? I'll give you a hint--both of them mention the names of those who stole the Millennium Falcon. Write in and tell us if you find out. And tell us about any other Star Wars books you've read!